A celebration of the food and flavors from the regions near the Southern and Eastern shores of the Mediterranean Sea, with over 100 recipes for modern and accessible Middle Eastern dishes, including Lamb & Sour Cherry Meatballs; Chicken, Preserved Lemon & Olive Tagine; Blood Orange & Radicchio Salad; Persian Flatbread; and Spiced Carrot, Pistachio & Coconut Cake with Rosewater Cream. Sabrina Ghayour is one of the strongest voices in Middle Eastern food today. This chef, food writer, and cooking teacher is the charismatic Persian-born host of the popular London supper clubs specializing in Persian and Middle Eastern flavors. With regular appearances on the BBC Good Food Show, Taste London, and more, her work has been featured in numerous publications, including The Times, the Sunday Times, the Evening Standard, the Guardian, the Independent, the Telegraph, Deliciousmagazine, and BBC Good Food magazine. This is Ottolenghi with rocket fuel. This book will delight fans of Ottolenghi-style food. The loveliest cookbook I've seen in a very long time. The most exciting debut cookbook of the year. The most appetising book. I want to eat every page of it. Persiana...is Sabrina Ghayour's first book and it s crammed full of wonderfully cookable recipes...I d like to cook and eat everything in it...They re very much geared to a modern lifestyle,...Unlike other Middle Eastern cookbooks, this one is easy to decipher, packed with lots of flavour and recipes are surprisingly easy to pull off. 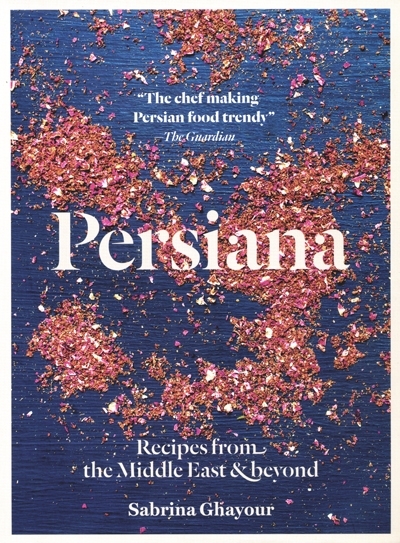 The arrival of her first book, Persiana: Recipes from the Middle East & Beyond, is a boon to those who long to serve their guests bountiful dishes of exotic, glamorous, unfamiliar food with a casual I-just-threw-this-together ...They ll be clamouring for more. And this book, unlike some others, has photographs that show the food clearly. Sabrina, a self-taught cook, food writer and supper club host, is on a mission to make the flavours of the Middle East accessible. Her recipes are essentially Persian but with influences from Turkish, Arab and Armenian cuisines. This wonderful Persian-born chef is a master of the Middle East and her book is sumptuous, thrilling, learned and downright brilliant. Persiana stands alone as a brilliant work of creativity... a captivating work. Middle Eastern food is all the rage, so this book is timely. Khayour brings authentic recipes up to date using a handful of simple, easily acquired ingredients. Plenty of inspiration. I ve come down with a strange disease for which their may be no cure. Call it a case of the creeping Ottolenghis. Ever since I started cooking from British chef and cookbook writer Yotam Ottolenghi s phenomenal Plenty a couple of years ago, I ve found my tastes shifting gradually eastward. I'm reaching for feta and mint instead of mozzarella and basil. Rice and whole grains are taking the place of dried pasta. And I m buying tahineh and yogurt in what seems like industrial quantities. Still, even as my dinners are becoming progressively lighter, brighter and more herbaceous, I find myself wanting to push even further into the cooking of the Eastern Mediterranean and Middle East. Fortunately, it seems the Ottolenghi effect has not escaped the notice of the publishing industry either here or in Britain. Four cookbooks have crossed my desk recently that go beyond the yogurt curtain. Any of them would make a terrific gift for anyone on your list who has been similarly infected. When I interviewed Ottolenghi for a Live Talks L.A. program this fall, he singled out Persiana by Sabrina Ghayour as one book he was especially excited about. Selected as the best cookbook of 2014 by Observer Food Monthly, it has just been published in the U.S. by Interlink Books.